Joe Palladino. Photo provided by White Unicorn Agency. 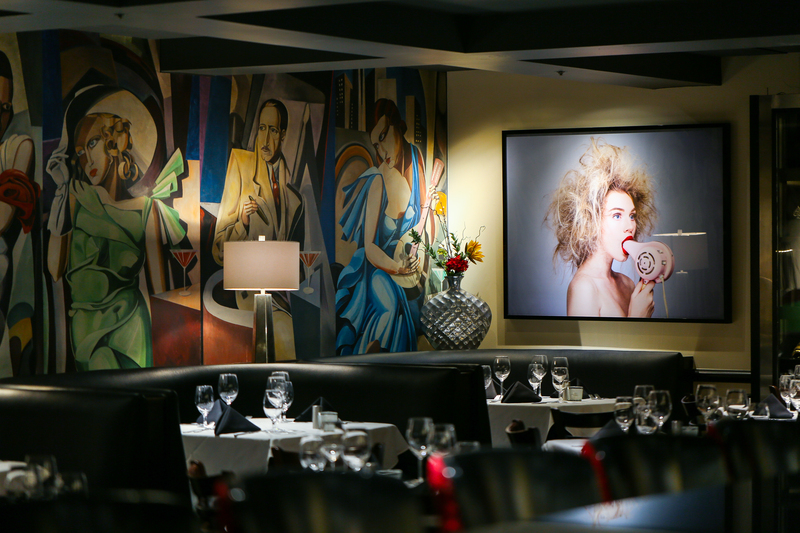 The restaurateur talks art and celebrities. The exterior of Nick & Sam’s Steakhouse has recently been painted a shadowy, charcoal hue. It’s a moody divergence from its previously creamy white bricks, and complements the building’s architectural origins. Before 3008 Maple Ave. was home to Nick & Sam’s, the space was occupied by steak and prime rib joint Lawry’s, and prior to that it was a morgue. The new exterior is the first thing you’ll notice when you pull in, but it isn’t all that owners Phil Romano and Joseph Palladino have recently changed. As Al Biernat’s expands to North Dallas and other high-end steakhouses open in spaces below Uptown office towers, Romano and Palladino decided to sink well over $100,000 into their existing bar—this is the reason I’m here. When their PR team reached out in regards to speaking with Palladino about the renovations, I ardently accepted. Yeah, okay, it’s easy to scoff at such invites. It’s my job to avoid becoming a vessel for pre-meditated, curated publicity disguised as “news.” But this invitation intrigued me. This steakhouse bar has a vibrant history and is a notorious stomping ground for celebrities. I wanted the scoop. The Nick & Sam’s space was finished out in 1998 and the restaurant opened in 1999. Nearly 20 years later, business is still thriving. I sat down with Palladino to discuss. Our chat has been edited for length and clarity. So, what’s new in the bar? A lot of things have changed here, we lightened the walls up. I brought in these beautiful bar stools with the black leather and red suede backing for a more lounge-y feel. The music has changed quite a bit. I like evolving. The art has changed considerably in here. All these photos are from Tyler Shields. These are pretty expensive photos—each one goes for over $20,000. I think it has a good feel. I pulled out the fireplace and I put in an Ace of Spades champagne cellar, which, another reason too is, I have a good relationship with Dez Bryant and he has part ownership of Ace of Spades. So he comes in regularly and he enjoys it. The bar with one of the new Tyler Shields photos. Photo by Catherine Downes. In the 18 years that Nick & Sam’s has been in business, the bar has gained quite the reputation for being a celebrity hotspot. Can you elaborate? We’ve had everyone in this bar from Tony Romo to Jimmy Kimmel to Matthew McConaughey to Jaime Foxx. You know, anyone who’s anyone and is coming into this town, or any big-name celebrities, always come to this bar. Which I like. And then our managers, especially Sunny our bar manager here, there’s not enough tables for her to manage the requests. Everybody wants to do a reservation in the bar, but we have so many regulars that we have to have a table for. So, like, the corner table there, in front of the Ace of Spades cellar, is normally the Cowboys table. That’s either Tony (when he was with us), or Dez or whoever it might be. That’s kind of their table. I remember having dinner in here with George Clooney and Rande Gerber and Tommy Armour, who’s a professional golfer who lived here in town. I mean, the amount of attention George Clooney was receiving, and this was 10, 13 years ago when Ocean’s Eleven came out. This was in the height of his career. You would have thought one of the Beatles were here. That’s how crazy it was. We’ve had The Black Eyed Peas in here with Fergie and all of them. Dirk normally likes to sit in the dining room. He’s different. He doesn’t need the whole show and things—very understated. I don’t know, we’ve had so many. I’ll never forget the Super Bowl here. We upset a lot of A-list celebrities because there were times we just didn’t have room for them. We’ve also been very, very good at allowing them to have their privacy. This is an exceptional conversation, just talking about the bar, it’s been 20 years, about what we’ve had here. But any time we have a real big VIP come here, we never say a word. Is there anything special that you do when celebrities come to visit? We have such an extensive wine cellar with celebrity-signed bottles given to me or to our staff. That’s been fun. We’ve rearranged them a little bit. When they come in we want to make sure that their names are the first on display. It’s funny, depending on the level of success of the athlete, is how we determine the wine that’s given to them to sign. That’s a little personal fun thing, you know? ’79 Opus is the first year of Opus, so I had Jerry West sign it. Jerry West is the insignia still of the NBA. Jerry West has to be on the ’79 Opus. It’s fun. Are the bottles a private collection? Yeah, they’re not for the guests. But, gosh, we must have hundreds of thousands of dollars [of wine]. We have Shaquille O’Neal, we have all the Cowboys. Anyone who’s someone has signed bottles…you take all these signatures and the value of them. And then our art, you take this room alone, we have $100,000 in art. Is it all stuff that you were personally drawn to? Yeah. I just thought it would be well received. It’s a little different from the average steakhouse. What I’m going to keep doing is buying different pieces. And you know what, they go up in value. You know, Steve Wynn put all those Picasso paintings in when he did the Bellagio. So I’m like the poor man’s version of Steve Wynn.